My head got tender and then a patch of hair fell out...Is it Stress or a Thyroid Problem or Both??? I am a 52 year old single mom. About two months ago my head became very tender and sore in one spot and then 1 week later my hair fell out. The bald spot is about the size of a quarter. I know I have been under a lot of stress this summer trying to get three kids off to college. Also, a couple of months ago my thyroid levels were elevated. My doctor is trying to adjust my medication level now. Can you please advise me why this may have happened and what can I do to ensure my hair grows back? 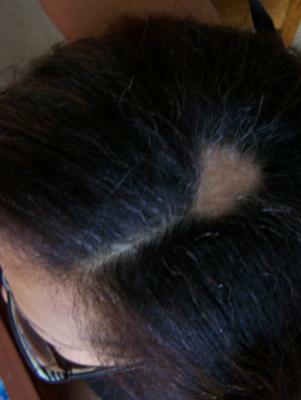 Comments for Stress or Thyroid Problem makes your hair fall out? Your current hair loss in a smooth round circle in association with thyroid disease is characteristic of alopecia areata. The good news is that localized alopecia areata is usually reversible and there is no scarring or permanent damage to the hair follicles. The challenge is that losing hair in one area and having the hair grow back does not mean that it will not reappear on another part of the scalp, so bald spots can show up in an unpredictable manner with some areas growing hair and other areas losing hair on the same scalp at the same time. Currently with only one spot present, local treatment with a topical cortisone preparation can help to get your hair to grow back. If the area is resistant to topical treatment, then intralesional injection of a higher strength of medication can be helpful. Stress can affect this condition by weakening the immune system which contributes to the autoimmune nature of this condition. So, let the stress go and make every effort to stay cool, calm, and collected. Also, when your thryoid levels are either too high or too low, you can get changes in the texture and strength which can also contribute to hair shedding, and thinning above and beyond alopecia areata.